When the United States entered the First World War in April 1917, the U.S. Army Air Service had a total of 55 aircraft of all types, none of which were fit for combat in Europe at this stage of the war. At about the same time the U.S. entered the war, a new 2-seat bomber type entered service with the RFC and RNAS, the de Havilland D.H.4, destined to be one of the most famous aircraft of the war. The D.H.4 was revolutionary: a bomber which at operational altitudes was as fast as the fighters opposing it, capable of carrying a useful bombload of 220 pounds over a range of 270 miles. In formation, the D.H.4 was capable of defending itself against attackers by virtue of its high speed, and the twin Lewis guns on a Scarff Ring operated by the observer/gunner. It would eventually become the most imnportant type used by the RAF's Independent Air Striking Force and would thus influence mainstream thinking about what constituted a proper bomber between the first and second acts of the great European Civil War of the 20th Century. In August, 1917, a D.H.4 minus its engine arrived in the United States. It was fitted with the new 400 h.p. V-12 "Liberty" engine, and flew with this powerplant for the first time on October 29, 1917. The mating of British airframe and American engine was completely successful, and the type was ordered into mass production at no less than three factories the following month. The first production American D.H.4 emerged from the Dayton-Wright factory in February 1918, and by October of that year production at Dayton-Wright, Fisher Body, and Standard exceeded 1,000 per month. By the time production was cancelled in 1919, Dayton-Wright had delivered 3,106, Fisher Body 1,600, and Standard 140. The first American D.H.4s reached France in late June 1918, and were intended to replace the French Breguet XIVs being used by American bombing and observation squadrons. On August 2, 1918, the D.H.4 became the first and only American-built aircraft to fly over Enemy territory in the First World War. Equipped with two Marlin machine guns for operation by the pilot and two Lewis guns used by the observer the American D.H.4 was more heavily-armed and marginally faster than its British cousin, while carrying the same offensive load over the same range. The one characteristic of the airplane the crews disliked was the positioning of the gas tank between the pilot and observer, which limited their ability to communicate in flight. Pilots immediately dubbed it "the flaming coffin," but wartime records show a loss rate no higher than other 2-seaters. By the time of the Argonne Offensive in September, 1918, the D.H.4 was operated by five bombing squadrons and seven observation squadrons of the U.S.A.S. As with the RAF's independent striking force, the D.H.4 formed the backbone of the independent American force led by Col. Billy Mitchell, and pioneered the long-range unescorted daylight mission that would be flown by its descendants 25 years later, with missions into the German Rhineland and the bombing of such heretofore off-limits targets as Cologne. Some idea of the hard fighting experienced by the D.H.4s in the last three months of the war can be seen from the fact that of the six Medals of Honor awarded to members of the Air Service, four went to D.H.4 aircrew. In October 1918, a standard D.H.4 was converted to the D.H.4B, powered by a 416 h.p. Liberty 12A, with the pilot's cockpit and the gas tank trading places. 1,538 wartime D.H.4s were rebuilt to this standard by 1923, when production was resumed on the modernized D.H.4M, of which 135 would be produced by Atlantic and 150 by Boeing. Whilethe D.H.4B was the mainstay of the post-war U.S. Army Air Service until it was replaced by the Curtiss Falcon in 1928, the D.H.4M would be the main equipment of the U.S. Marine Corps and would see combat service in Nicaragua during the 1920s, where it became the first dive-bomber to provide close support to ground troops, and "wrote the book" the Marines would follow during the Second World War and ever since. The last military D.H.4 was not scrapped until 1932. Surplus D.H.4s were purchased by fledgling air lines after the war, and were responsible for the development of air mail and the U.S. airways system, flown by men who would go on to found the American civil aviation system, such as a young ex-Army flier named Charles A. Lindbergh. 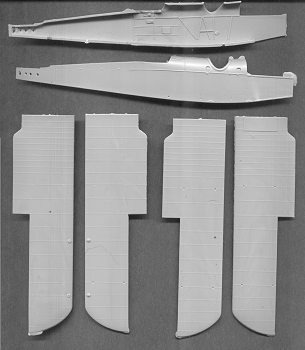 There have only been two other 1/48 injection-molded kits of the D.H.4: one by Aurora in the lat 1950s, and one by AMT (strongly influenced by the Aurora kit) in the 1970s. There were persistent rumors during the 1990s that Glencoe was going to bring back the Aurora kit, but this never happened. As I recall, both kits were accurate in outline and dimensions, and with a little scratchbuilding in the cockpit area could be made up into attractive models for their time. The Blue Max D.H.4 follows this company's standard practice for limited-run kits: only 1,500 kits will be produced. While other limited-run companies have recently improved their technology, Blue Max remains resolutely as it has always been, using low-pressure injection molding one kit at a time. 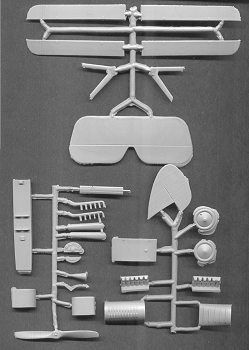 Thus, the plastic is quite soft, and there are thick sprue gates and more flash on the parts than one is used to nowadays. Detail parts are made in non-toxic Pewter; unfortunately, in shipment these metal parts are often bent and twisted, though with a bit of care they can be restored to their original configuration. 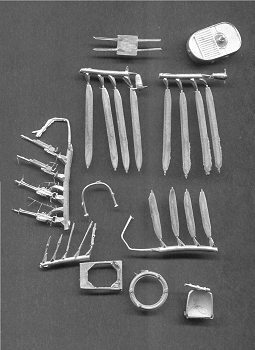 I was very happy to note that this kit includes pewter interplane and cabane struts, rather than requiring the modeler to cut out struts from old Contrail strut material. Blue Max is well-known for producing a very accurate-looking fabirc effect on the wings of their kits - and for the "dread wing ripple," a phenomenon of the relatively-primitive production methodology; fortunately, my example had great detail and no ripple, and it would appear from the wing design that the ripple may be less on this kit than in previous releases. Decals cover two aircraft, an early-production D.H.4 from the 150th Observation Squadron, and a late-production (distinguished by a pilot's headrest) airplane from the 168th Observation Squadron. Given that the late-production airplane is painted overall olive drab - upper and lower surfaces, struts and landing gear - while the early production airplane is not only in a more colorful scheme but in the markings of the D.H.4 flown by Lts. Harold E. Goettler and Erwin R. Bleckly on their Medal of Honor mission in support of "The Lost Battalion," on October 6, 1918, I for one certainly know which version will end up on my model shelf. 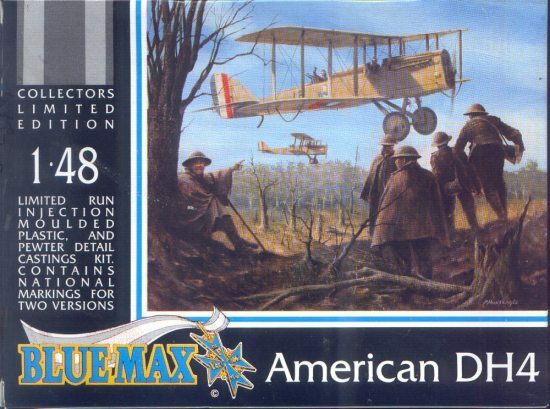 Blue Max kits are not Eduard when it comes to production quality and ease of assembly, but with "some modeling skill required" and experience in working on World War I models, the end result of the effort is a good-looking model. I think this is the best Blue Max kit to be produced to date, and I have built just about every one of their kits. No modeler who wants a collection American aircraft that includes the truly important airplanes of that history can overlook the American D.H.4. Thanks to Squadron Mail Order for the review copy.